SCP-3602-A-9 with one of its young. Special Containment Procedures: Site-220 is to retain at least one Mandarin-speaking parazoologist specializing in primate behavior and psychology. This researcher, which since 1968 has been Dr. Shufan Shen, is to serve as a liaison to SCP-3602. At least twice weekly, Dr. Shen must conduct visits for the purposes of observation, information gathering, and diplomatic relations. Following Incident-SCP-3602-01, a Mandarin-speaking psychiatrist must also be retained to conduct bi-monthly therapy sessions with each instance of SCP-3602-A. All instances of SCP-3602-A and SCP-3602-B are to be contained within a secluded region of Site-220's Parazoology Reserve, known publicly as the Baihe Natural Reserve.1 Each instance is to be fitted with a remote tracking device, with newborn SCP-3602-B instances receiving one at 6 months of age. Remote surveillance of SCP-3602 is to be maintained at all times, with the recording of SCP-3602-A instances prioritized. Any attempt by an SCP-3602 instance to leave the Parazoology reserve is to be punished by 1 week of confinement within Site-220's holding cells. Repeat offenses are to be punished by confinement periods with lengths escalated accordingly. 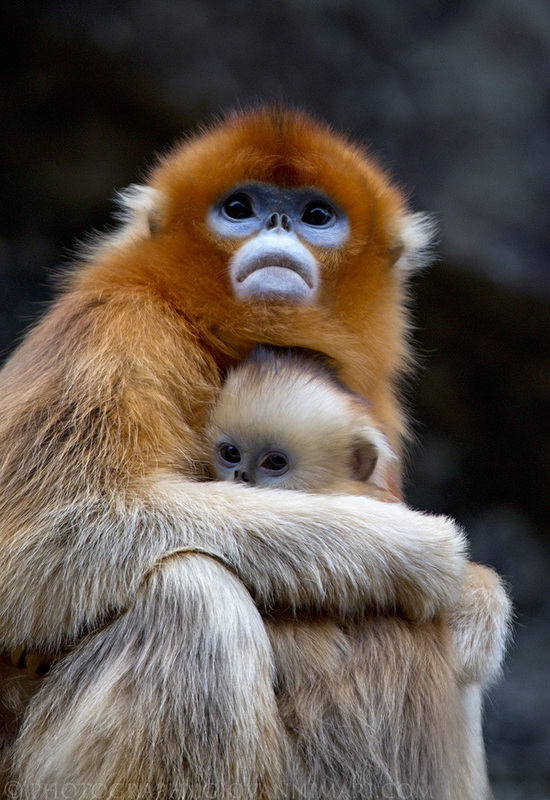 Description: SCP-3602 is a community of approximately 400 Rhinopithecus roxellana, more commonly known as the Golden snub-nosed monkey. All instances of SCP-3602 are sapient and capable of human speech. Mandarin serves as the primary means of communication, with several local dialects spoken less commonly by older members of the community. Instances have no physiological deviations from non-anomalous specimens, and, with the exception of SCP-3602-A instances, have identical sustenance needs and lifespans. How SCP-3602 instances are capable of human vocalization despite the lack of morphological deviation is unknown. The community makes regular use of simple tools, and is able to utilize fire as a source of warmth. The SCP-3602 population is divided into two distinct groups, SCP-3602-A and SCP-3602-B. SCP-3602-A is a group of 18 specimens that are biologically immortal, with an estimated age of 1800-2200 years. SCP-3602-A serve as the leaders of the community, with roles analogous to that of tribal elders in many human societies. SCP-3602-A instances are incapable of sustaining serious injury regardless of circumstance, and appear to display a high degree of metaphysical permanence. SCP-3602-B instances form the remainder of the community, and are all descended directly or indirectly from the 18 instances of SCP-3602-A. SCP-3602-A claim to be followers of the Chinese deity Sun Wukong, who they credit for their sapience and immortality.2 The oral history of the community is primarily based on Wukong and his exploits. Particular emphasis is placed on his rebellion against the Jade Emperor and the defacement of the register of death, the latter of which is claimed to be the reason SCP-3602-A are unable to die. Tales often end with an instance of SCP-3602-A informing the assembled SCP-3602-B instances that Wukong will someday return to lead them to glory. Multiple instances of SCP-3602-A have confided to Dr. Shen that the storytelling is intended to motivate SCP-3602-B towards ambition and self improvement. SCP-3602-B display noticeably lower intelligence than their immortal forebears, with most having comparable intelligence to Human children aged 5 to 9. Subjects are generally cheerful, easily amused, and have a low attention span. On three occasions between 1968 and 1981, Dr. Shen observed a large scale effort by SCP-3602-A to educate SCP-3602-B on the use of more complex tools. Most notably, in 1975 SCP-3602-A attempted to convince SCP-3602-B to construct and reside in permanent structures. These attempts have failed without exception due to lack of interest on the part of SCP-3602-B, who often mollify their elders by displaying usage of more simple tools instead. Incident SCP-3602-01: On 04/04/1984, SCP-3602-A-9 attempted suicide via self immolation, but was unsuccessful due to its anomalous qualities. Instance was then taken to Site-220 for interrogation regarding the incident. Interviewed: SCP-3602-A-9. Subject is among the primary matriarchs of the community, and responds to the name Sun Daiyu. Foreword: Subject was in considerable emotional distress during transport to Site 220, and 2 days elapsed before subject was considered calm enough to be interviewed. Interview is translated from the original Mandarin. Dr. Shen: "Daiyu, what happened? You've never shown suicidal urges before, why did you try to kill yourself?" SCP-3602-A-9: "Oh tall one3, you've walked among us for more than ten years and yet know so little. This isn't the first time I've tried, nor will it be the last. All among the elders have tried at least once." Dr. Shen: "…Why? You all have your children, your family, your history. I just don't understand." SCP-3602-A-9: "I have lived for two thousand winters. In that time I have birthed, raised, and outlived countless numbers of my children. I have watched our home disappear and the brief glory of our past be forgotten. Sun Wukong raised us up, made us immortal, and together we challenged the gods themselves. How could we ever be satisfied living like the animals we once were? We saw the sun and now walk in the mud for years unending. And wherever our Father is, he has forgotten us." SCP-3602-A-9: "Our children don't understand us. They live brief lives and are content to be mere animals. I am not. I wish I had died when I had the chance. I wish that Wukong had never hatched from the stone egg. I wish that he had remained trapped beneath the mountain, burned by Laozi's fire for all time. It would have been a kinder fate than the one he forced upon us." Closing Statement: Dr. Shen submitted a proposal to utilize anomalous means to terminate SCP-3602-A instances should they request euthanasia. Proposal was considered by the regional ethics committee, and denied in a 5 to 4 vote. 2. Wukong is also known as Son Goku, the Monkey King, and the Great Sage Equal to Heaven. 3. Approximate English rendering of the Mandarin 高个子. General term used by SCP-3602 to describe humans.